The bulky flat foldable box is filled with an inner white box containing the bags with parts numbered from 1 to 4. The other bags numbered 5 to 13 are loose in the box, resulting in a total amount of 25 numbered bags. Besides this, there is the battery box and Power Functions L-motor, four red rims, four so-called 'Unimog tires' (Element ID 4610381), two hefty instruction manuals and a sticker sheet containing a staggering amount of 72 decals. The building process is divided into thirteen sections. 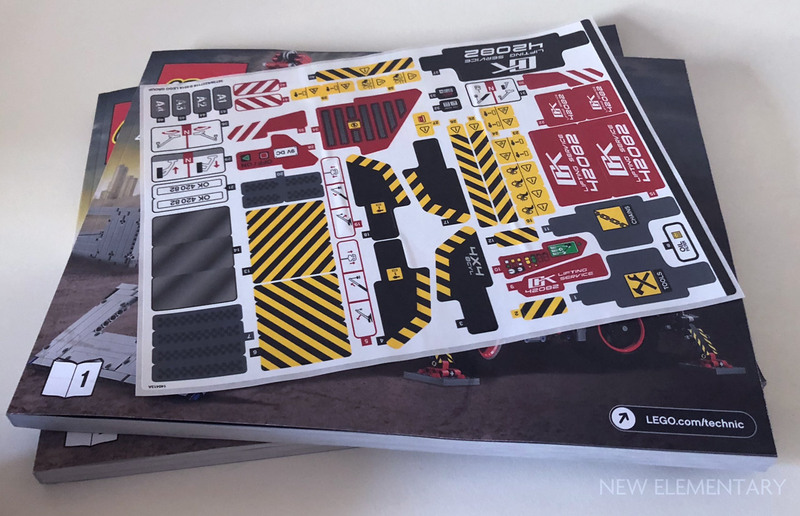 The first book has 348 pages and describes how to build the lower structure ('the vehicle'), the second volume is 332 pages in length and deals with the upper structure ('the car'). 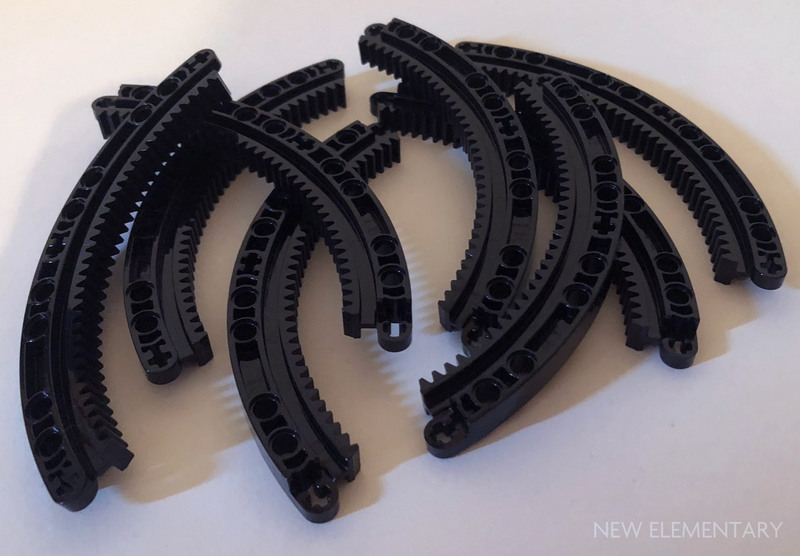 Disappointingly, 42082 contains no new moulds yet it does include the Curved 11 x 11 Gear Rack first introduced in 2016 but in Black (Design ID 24121). This neutral color is a welcome addition to the Technic parts range. You get eight of these. As mentioned, the build is divided in thirteen stages, the first dealing with the central lower gearbox. There are a total number of three gearboxes in this set. The upper structure contains the motor and central drive train, so this lower gearbox only operates two functions: the 360 degree turning of the upper structure and the raising and lowering of the four outriggers. 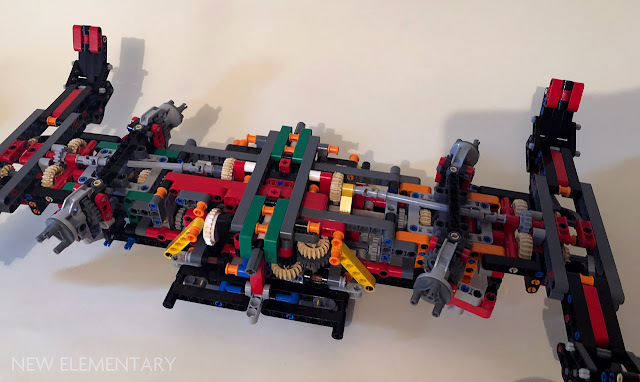 The part where the central axle will enter the lower structure is set up in a way you can change the direction of the lower functions quite easily. An impressive amount of vertically mounted gears will make sure the rotation of the crane will both be powerful and considerably slowed down. This part of the build is quite reminiscent of 2009's 8258 Crane Truck, that was the first of a wide range of sets with complex gearboxes. Next up are the two steering units, since this crane is not only four-wheel drive, but also has double steering. These units are completely identical except for some Technic beams in green and orange, so you can distinguish both ends of the model. Besides a differential, each unit has so-called portal axles, enabling a higher ground clearance for the wheels. Printing the build for the steering unit in the manual only once could have sufficed. That especially goes for phase 3 in which the stabilizers are constructed. I have found no difference at all between the front and the back units, yet their individual builds have been included in the instruction manual. Again, this part of the construction is reminiscent of set 8258 Crane Truck. The stabilizers are set into motion by four small Linear Actuators (Element ID 4262100). 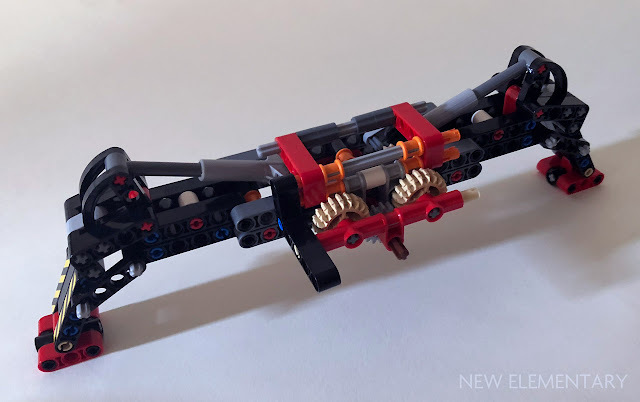 These sections are operated from the centrally placed lower gearbox by a series of universal joints, which is not the smoothest or most subtle way to convey movement. 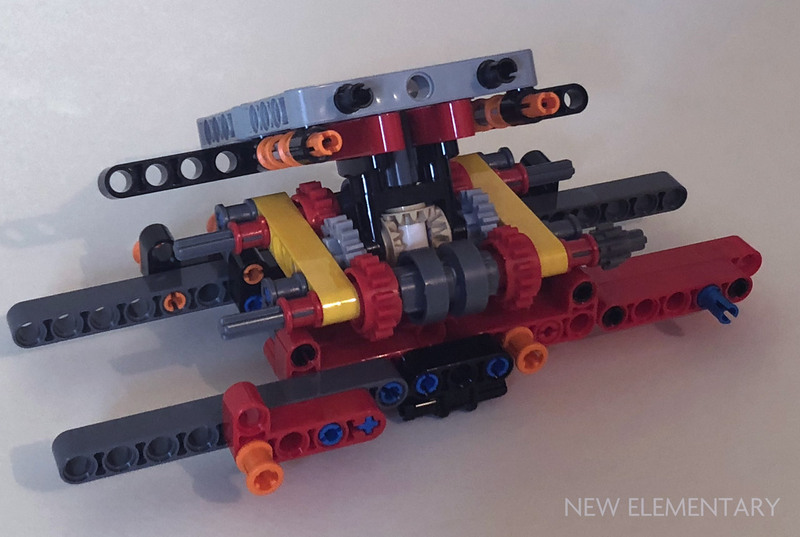 The way these outriggers glide along the curved part of the Technic Liftarms 3 x 3 L-Shape with Quarter Ellipse (Design ID 32249) is rather elegant. Things are finally taking shape in stages 4 and 5. First up is the back side of the model that contains both the steering wheel and a 8 cylinder fake motor (the latter being effective albeit nothing quite out of the ordinary). Stage 5 creates the front section of the crane. Both sides, again, are quite similar in construction and contain both a bumper and stickered license plate. Even though there seems to be a lot of repetition, personally this did not feel like a drag to build. Stage 6 is by far the most interesting portion of the build, containing the giant turntable built from the eight quarter-circle gear racks. Its construction is the result of the labor of a true genius. The lower half of the turntable, comprised of four gear racks, is mounted to the rest of the structure. 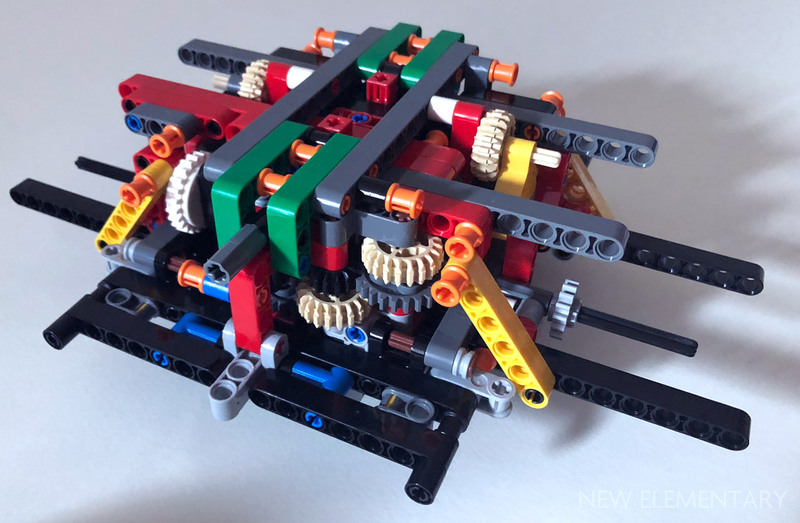 Good use has previously been made of the slits in the parts in Creator Expert 10257 Carousel but the usage here is a true masterpiece of construction. Within the slits rests an octagonal ring consisting of eight small black train wheels (Element ID 4295370) held in place by 1L bars with tow ball (Design ID 22482). This is then covered by another ring of gear racks mounted to the rotating top of the smaller inner turntable. The result is a very sturdy big 21-stud wide turntable that operated smoothly thanks to the octagonal ring with wheels that can rotate between the two rings freely similar to a ball bearing. Astonishing! 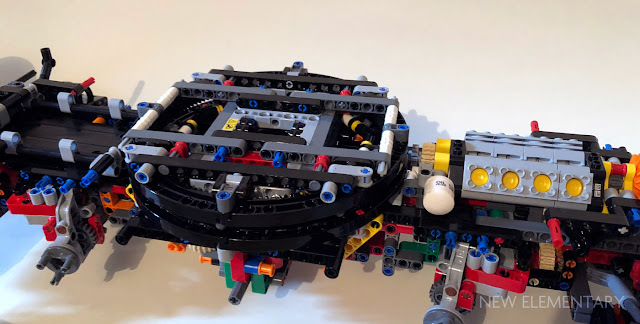 The lower structure and first instruction manual are finished by building step 7, that explains how to build the laddered side panels that are similar, yet mirrored and step 8 that is comprised of the mud guards (basically the same build repeated four times) and the wheels. The result of these efforts is a rather voluptuous car with huge wheels with a high part density. Seen from the side there are just two small openings visible. Five stages of the build are left and most of these are devoted to the build of the red crane. 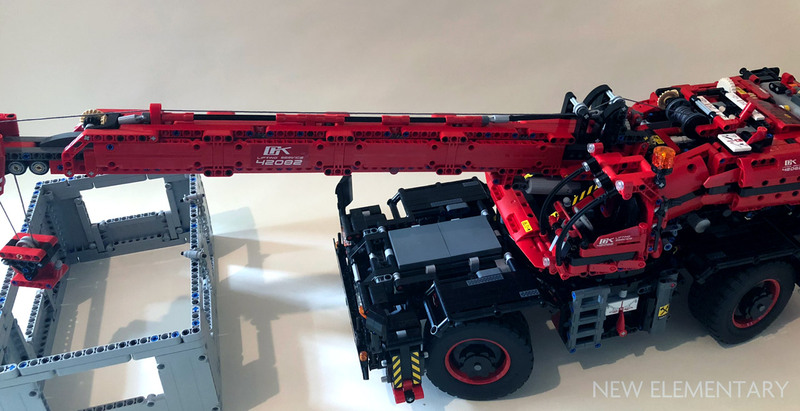 You will find that this crane is pretty much similar to other Technic cranes or crane trucks we have seen in the past, including set 8421 from 2005 and its officious, bigger follow-up brother, set 42009 from five years ago. Being a different type of crane, 42082's crane section is bigger relative to its overall size. 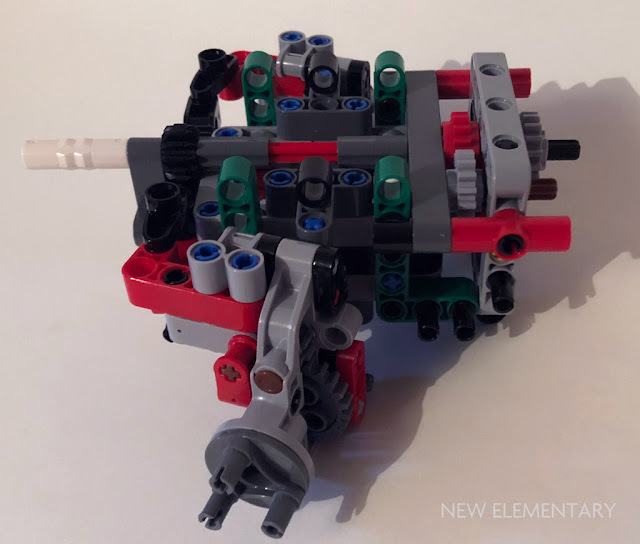 You start with constructing two more gearboxes: one makes you switch between the functions of the lower part of the crane and the upper three functions. The other gearbox enables the three functions of the crane itself and is linked to the L motor included. This latter gearbox can be operated into six positions, two directions for each function. The battery box, that also serves as a counter balance, can only be switched on in one direction, making sure the motor can only run one way. This part of the build also includes two parallel placed Linear Actuators (Element ID 4528037) that are strong enough to lift the gigantic crane arm. Two white rubber bands around two axles supposedly make sure there is some friction, although their exact purpose remains somewhat unclear. Stage 11 is all about the enormous 54-stud long extension arm. It rolls out quite smoothly thanks to four small rubber tires and its drivetrain is constructed out of a few steering joints (Element ID 19991). Despite its somewhat strange angled set-up, all runs smoothly and this is the moment it becomes clear how humongous this plastic machine is! This stage is wrapped up with building a hook, that is just heavy enough to have sufficient weight. I do miss the old metal hook (Design ID 70644) last seen in 2006. Quite interesting is that there are hardly any knots required in the sturdy dark grey string. It is all tied to existing slits and gaps in parts and only one end of the string requires a small knot to keep things in place. The last two stages are focused on the finishing touches. 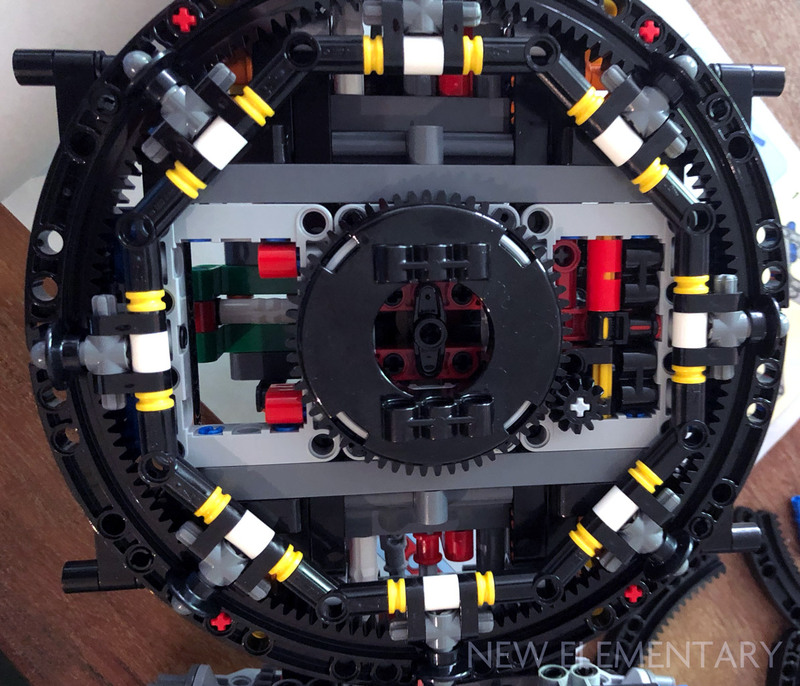 A lot of Technic panels are linked in, at times at somewhat strange angles. These cover up the machinery of the inner gear work and the battery box perfectly. Subsequently the cabin is formed, which contains a nicely angled steering wheel as well as a seat and an sliding door that makes use of a simple yet effective construction. Almost last, but not least, the build is concluded by what probably should be the walls of a future house or building. These are made up out of four pieces that hold together quite nicely, until you decide to lift the entire assembly. It is a bit of a disappointment this extra addition to the build falls apart as soon as you pick it up. Also, four plates made out of regular System plates and tiles are assembled, that need to be shoved under the outriggers. A bit of an odd choice, because without these, the outriggers will not touch the ground. A nice feat, however, is the fact these plates can be stored on top of the substructure. 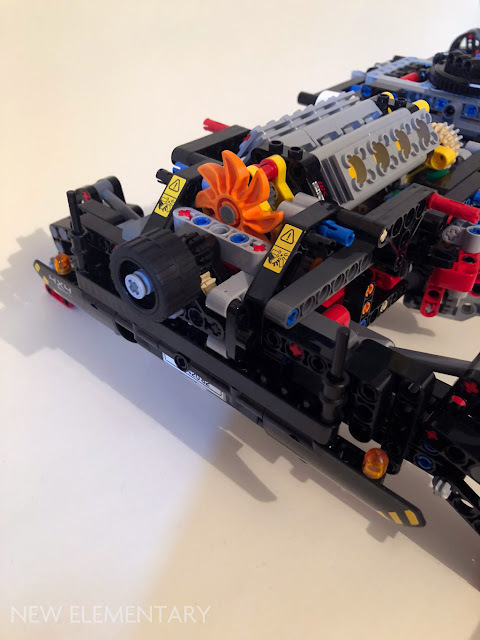 42082 Is an impressive piece of LEGO Technic engineering. When fully deployed, it is over one meter in height which itself is enough to make your jaw drop. 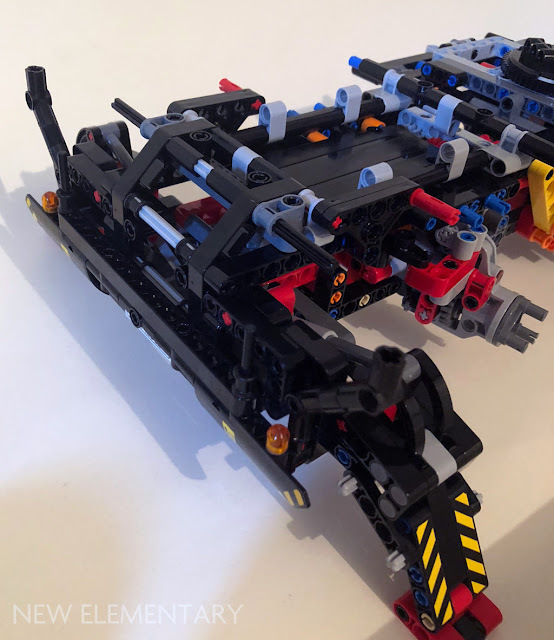 The build contains quite a few repetitions, but at the moment when this becomes somewhat of a stretch, construction of the interesting upper part commences. 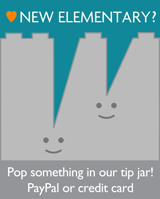 My building experience contained quite a few errors; more than usual. (This will probably be visible on some of the pictures I took of the assembly process.) Nothing that could not be fixed, but it requires attention and dedication to finish this crane. 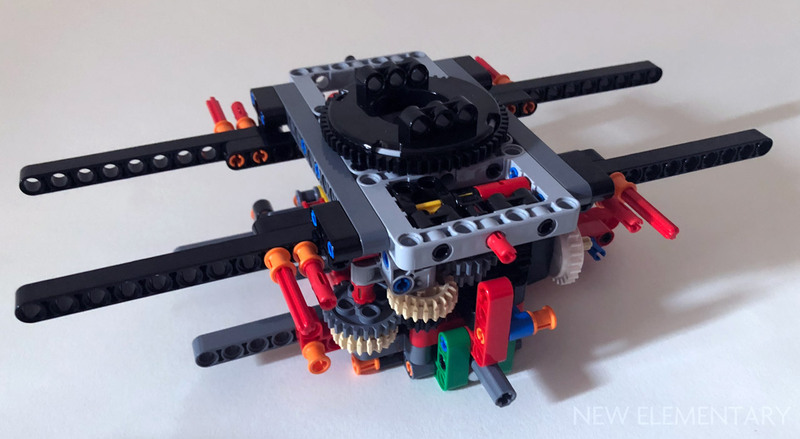 Now, I really enjoyed the build so this most likely is due to either my impatience or lack of attention, but I will not rule out some younger builders may experience problems similar to mine. 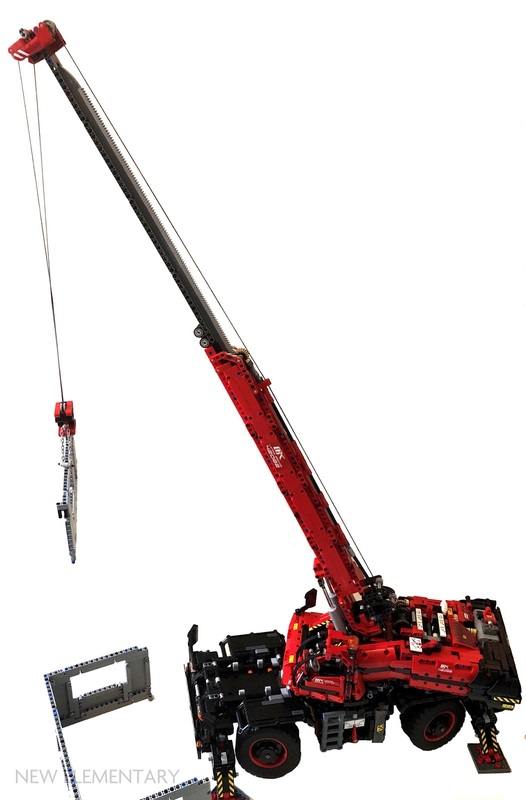 The functions of the crane include: moving the outriggers, four-wheeled drive and steering, an eight cylinder fake motor, rotation of the upper structure, lifting and lowering of the boom, extending of the boom and lowering and lifting of the hook. Unfortunately, set 8421 is the only crane truck that enable the functions of extending of the boom and lowering the hook to go together. In case of 42082 that is hardly a problem, because once the boom is extended, the hook can be moved freely since it is not hindered by any blocked gears. 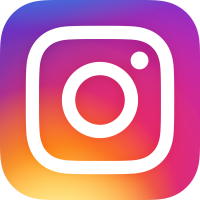 The 360 degree rotation does not run extremely smooth, but rather shaky. The four wheeled steering does not prevent the turning circle to be quite large. The choice of four plates to be placed under the outrigger is a strange one, yet being able to store these on the truck itself is rather cool. 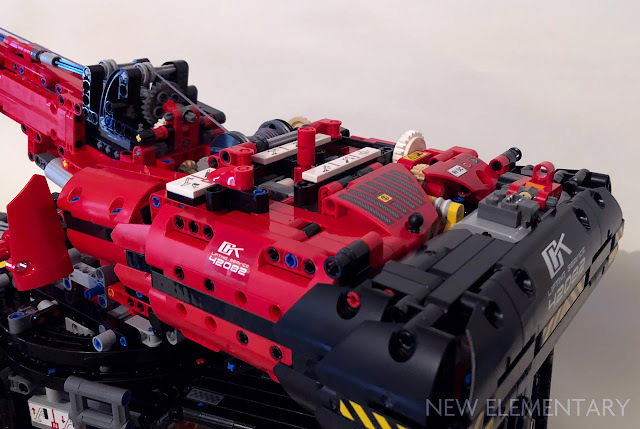 Despite its few flaws, the biggest Technic set to date is more than meets the eye. First images did not give the impression this was a 4,000 piece set. Most work goes into the lower part, which is a complex and dense vehicle. And seen in the flesh, especially fully extended, this is an imposing kit, worth the bucks and a good parts pack. Thanks for not putting the finished model as the cover picture. It felt like I was getting to build it and only see it when it was done. I believe the plates than mount underneath the outriggers are meant to be stability pads, which on real rough terrain cranes are used to prevent the outriggers from sinking into soft terrain such as soil or sand. They're not permanently attached to outriggers on real cranes which is also why they're not permanently attached to the outriggers on the Lego model. As for whether or not outriggers on real cranes can reach the ground without pads, blocks, or other support - I have absolutely no idea.